The is the second Swedish edition of Coyote Waits published in 1993 by Bokforlaget Legenda AB in Stockholm, Sweden. Coyote Waits is the tenth Navajo Mystery novel by Tony Hillerman. 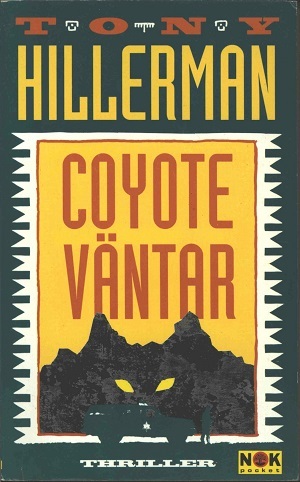 This edition was translated from Tony Hillerman's original text in English to Swedish by Ulf Gyllenhak. The cover design is by John Eyre. The cover contains the images of a mountain with eyes, a police vehicle, and a policeman. The cover art is also bounded by a white border. Format: paperback, 17.7 x 11 cm. Binding: Full-colored paper covers with the author, title, and publisher's logo printed vertically in white on the spine.